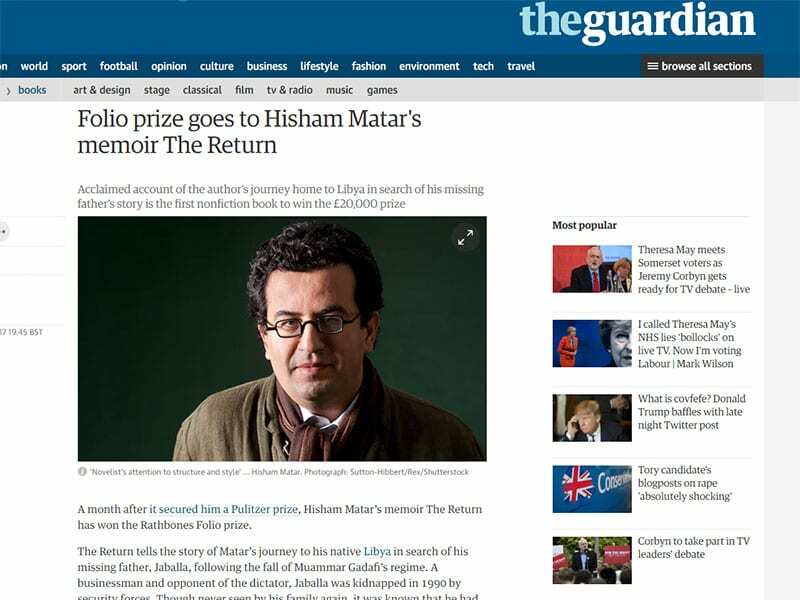 A month after it secured him a Pulitzer prize, Hisham Matar’s memoir The Return has won the Rathbones Folio prize. The Return tells the story of Matar’s journey to his native Libya in search of his missing father, Jaballa, following the fall of Muammar Gadafi’s regime. A businessman and opponent of the dictator, Jaballa was kidnapped in 1990 by security forces. Though never seen by his family again, it was known that he had been taken to the notorious Abu Salim prison in Tripoli, where 1,270 prisoners were murdered in 1996. Critical acclaim has followed the memoir, which won the Pulitzer biography prize and was also shortlisted for the Baillie Gifford prize for nonfiction and the Costa biography award.